This beautiful engagement party at Bella Rose Garre Winery in Livermore, CA evoked the feeling of romance and love. The linens, drapery and furniture from Pleasanton Rentals added softness and elegance to this lovely venue. The flowers were arranged in both gold wood boxes and gold footed dishes, to add variety to the tables. 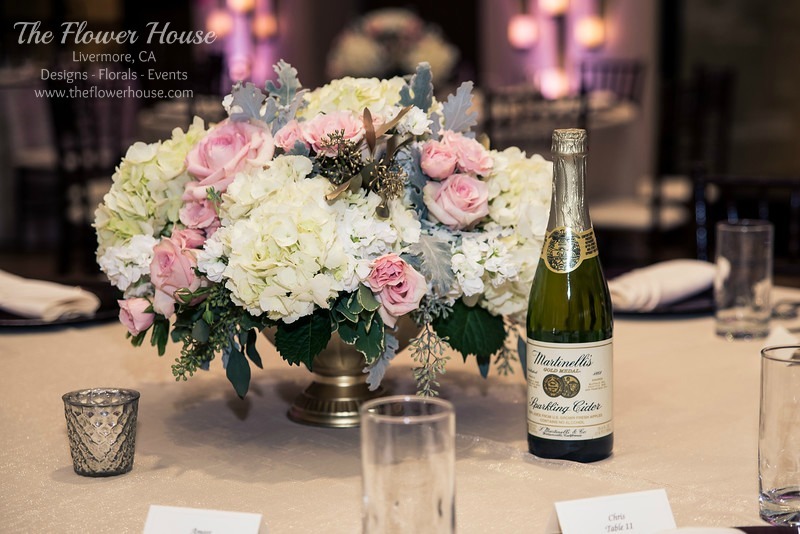 The flowers were a soft and elegant mixture of white hydrangea, pink tea roses, blush roses, white stock, dusty miller, and gold seeded eucalyptus. The Stage for the newly engaged couple was set with furniture and a backdrop of drapery with floral tie-backs and golden pedestals adorned with dripping arrangements matching the centerpieces.